Casein versus Whey Protein for Bodybuilding - What's The Difference? Casein versus Whey Protein for Bodybuilding – What’s The Difference? HomeCasein versus Whey Protein for Bodybuilding – What’s The Difference? Putting Casein vs whey in a head-to-head match is not really fair, because both are extremely effective in different ways. Whey Protein should be taken immediately after a workout and first thing in the morning. Casein protein should be taken right before bed, or any time it will be many hours before your next protein meal. Whey is fast acting and absorbed into the bloodstream very quickly. Casein protein breaks down slowly and provides a steady stream of amino acids over a long period of time, making it particularly effective while you sleep and during lengthy intervals between meals. Protein powders that contain several different protein sources have become very popular lately. These blends will give you the benefits of fast and slow digesting proteins to help keep the building blocks of muscle available for longer periods. For those that are lactose intolerant, see my article Lactose Free Protein Powders. ​Whey Protein bodybuilding dosage: 30-50 g upon waking in the morning, and another 30-50 g post workout. Casein Bodybuilding Dosage: 30-50 g Casein protein before bed. 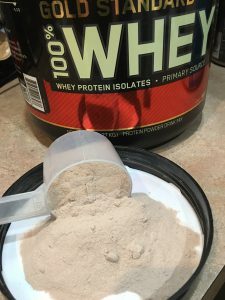 Serious Bodybuilders should use dosages of both Casein protein and whey protein at the appropriate times to give them both short and long term supplies of amino acids. ​It is important to get a total of 1-1.5 g protein from all sources per pound of body weight EVERY day, whether you workout that day or not. You should try to get most of it from chicken, fish, lean steak, etc. Whey protein powder shakes are best for first thing in the morning and before and after workouts. Casein protein is best to take before bed and when you may not have another protein serving for a while. This is because casein digests slowly, feeding your muscles for an extended period of time. Plus, most powders are absolutely delicious as a night time snack! I have a tub of both types of protein in my cupboard at all times. I will sometimes mix them together just for a change. 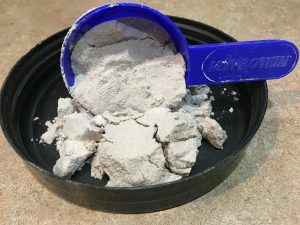 Casein is much thicker and will require more liquid than whey to dissolve, especially if you are not using a powerful mixer. Also see Do I need protein powder to build muscle? Read more about Whey Protein at Wikipedia.